Should you Rent or Purchase? There’s a constant notion that spring is the time of year when we’re supposed to clean up our homes and make a totally fresh start. What a lot of people don’t realize, though, is that fall is also an awesome time to clean and change your home! What is it that sets fall apart for this kind of thing? Well, fall is when college classes start up for the year, and when kids are packing up all of their stuff to move into their new dorms and homes. For this reason, this is the time of year when you’ll find more organization systems, cleaning supplies, and furniture in stores than any other time of year. College students need to stock up on stuff for their dorm rooms, so stores take advantage and of this and fill up their shelves with these items. Thinking of redoing your closet? Wait ’till dorm season starts and you’ll probably have way more to pick from than if you decide to look at a different time of the year. Stores will highlight cleaning supplies especially (parents want their kids to clean! ), so a lot of the time you’ll find things like multi-purpose cleaning wipes and scrub brushes on sale. Stores like Target and Walmart are great for these kinds of finds, making it super easy for you to establish a totally new cleaning season for yourself. Another often unnoticed benefit of cleaning is your relationship with your landlord. When a landlord notices that you care about keeping your rental clean, he/she will see you as a tenant that will protect the property owner’s investment. So, be sure to let your landlord know when you intend to spend some time cleaning, maybe even ask if the landlord can provide some cleaning supplies or tools for you to use. To take it a step further, your landlord might be willing to pay for paint or other supplies if you agree to do the work. So, let your landlord know that your really care about your rental home, and the next time you need a favor from your landlord, you might have some additional leverage. 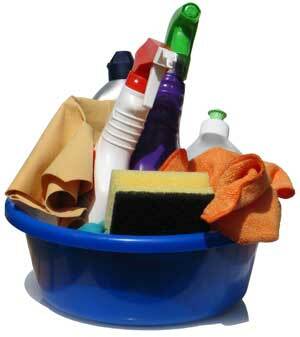 If you are really busy, and can afford it, maybe you should hire a cleaning service to do the work on a weekly basis. BE SURE to let your landlord know about this, because it is not a good idea to let just anyone into your apartment, and you could be violating your lease conditions. Besides, giving someone your key could get you into other trouble or end up with you losing some possessions if the cleaning person is untrustworthy. By the way, that is a good reason you should have renter’s insurance! Additionally, there are cameras that can monitor the inside of your apartment (via phone), and they are usually under $200.00. This way you can keep an eye on anyone inside your rental, and also comes in handy if you have an unattended pet. At Tenants.com, we are busy setting up relationships with reputable companies that provide cleaning services in your area. Here are some suggested companies. Sign up to get your free eBook "What ALL Tenants REALLY Need to KNOW" PLUS, you will have access to ALL of the Tenants.com product discounts, free services, and killer advice for tenants! We'd love to help you become a smarter, more informed tenant!